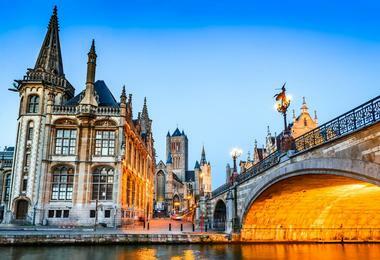 Belgium's port city of Ghent, self-described as the city of trust and love, sits at the confluence of the Scheldt and Lys rivers. The university town is a cultural hub that’s part artistic quarter and part historic center. The pedestrianized city center is a showcase of medieval architecture, including the fairy-tale-like 12th-century Gravensteen castle. For visitors who want to get to the heart of the city’s personality, take the Sorry, Not Sorry walking tour of Ghent’s graffiti. 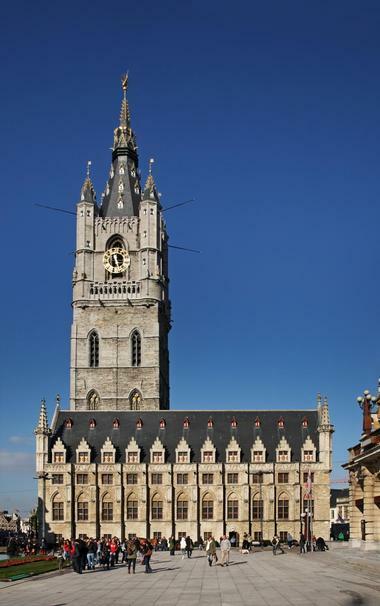 The Ghent Belfry is the city’s symbol of independence. Built in 1313, it originally held the municipal privileges (similar to a town’s charter) in a secret room. The dragon symbol on the tower is symbolic of guarding the privileges. A single alarm bell, installed in 1325, became an hourly bell 50 years later. By 1442, the belfry served as the city’s watchtower, where trumpeters and bell ringers would warn of imminent danger – usually fire. Over time, more bells were added until a 54-bell carillon was completed in 1993. The belfry was placed on the World Heritage List in 1999. Visitors may choose self-guided tours or join a single daily guided tour. Citadelpark is one of Ghent’s oldest, largest, and most popular parks. It was built for the 1913 World Exhibition on the site of a former Dutch citadel, hence the name. 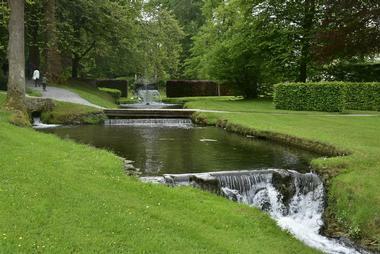 The expansive green space is within walking distance of Ghent’s historic center, near the Sint-Peiters train station. The lush grounds feature exotic tree species (labeled with their Latin names), flowers, ponds, a small waterfall, and numerous sculptures. There is an ornate cast-iron bandstand, which hosts the occasional music event. Two museums are also in the park, the Municipal Museum of Contemporary Art and the Museum of Fine Arts. Both museums charge a fee. Visitors are encouraged to explore the park during the daytime for safety reasons. Design Museum Gent has a permanent collection of about 22,000 objects. 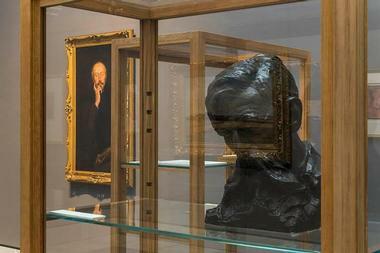 Founded in 1903, the oldest part of the collection is the 18th-century French furniture. The bulk of the collection is mid-1970s art nouveau, art deco, and Italian postmodernism. 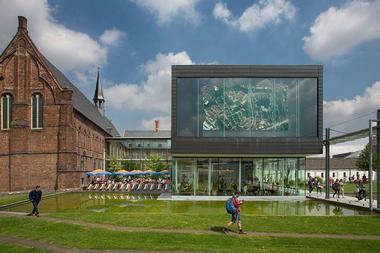 The museum is based on a model of “good examples” of applied art, featuring several disciplines. 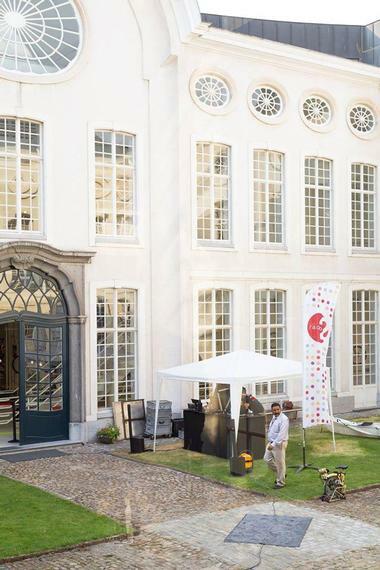 Visitors will find the work of famous Belgian designers like Emiel Veranneman and Piet Stockmans, although some international designers are represented as well. There are often a number of exhibitions showing at the same time, like Karel Martens: Motion and the Alonso International Glass Collection. Gent Free Walking Tour is for travelers who like to know the secrets of a travel destination that most tourists never learn from their guidebooks. This is an opportunity to learn to love Ghent like a local. Participants will visit and learn about significant historical must-see places in the city like Ghent Belfry, Graffiti Street, and Granvensteen Castle, but will also discover so much more. Guides share the history and legends of the city, urban myths, local inside jokes, and the university life for students. They’ll share the best places to grab lunch, have a cocktail, or enjoy a good dinner. Tours are 2 hours and meet outside the Uppelink Hostel. 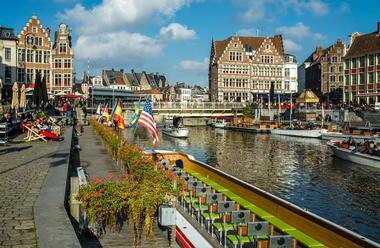 Gent Watertoerist provides individual and group boat tours of Ghent. 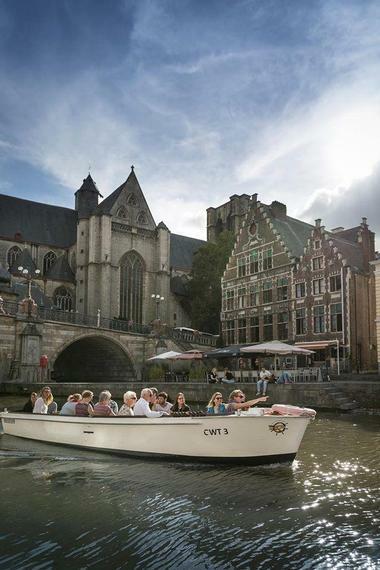 Standard boat tours are 40 minutes in length, and travelers will learn about Ghent from the Middle Ages to today. Visitors can choose open or glass-covered boats. The departure point for boat tours is the Graslei on the Lys River. Gent Watertoerist offers boat trips with Gulden Draak Beer, trips with catering, combination boat/walk daytrips, and combination culinary boat/walk trips. The Guided Boat Trip with Visit to Gruut Brewery includes three Belgium beers, while Nibble and Chat De Luxe stops at three places to dine on a combination boat/walking tour. 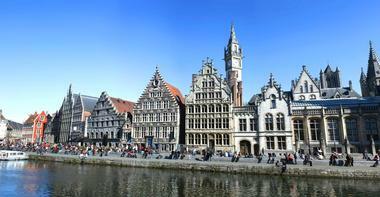 Stadsmuseum Gent is the Ghent City Museum, and aims to present the city’s story to travelers. This fascinating tour takes visitors on a circuit of exhibits in chronological order that trace the growth and development of Ghent. A local vision in 1833, the museum grew from a small donated collection to a municipal museum with significant objects in 1884, when its first curator was appointed. It grew to include examples from all art disciplines today, including stained glass, china, coins and medals, scale models, and items from trade guilds. Audio guides that tell the story of Ghent are available for a nominal fee. 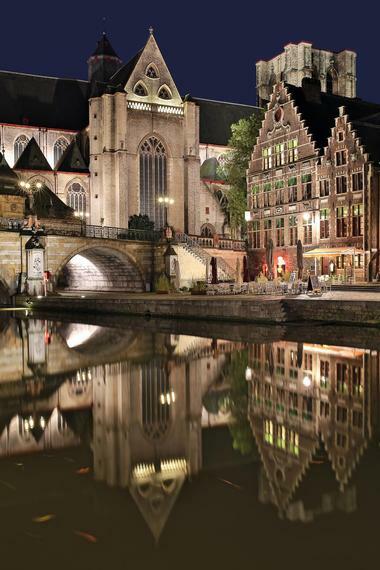 Graslei is a magnificent medieval port in the heart of Ghent featuring a row of one-of-a-kind historical buildings that are beautifully reflected in the lengthy river on one side and the Korenlei on the other side. A meeting place for all who visit or live in the city, it boasts beautiful cobblestone walkways, majestic bridges, and quaint cafes. 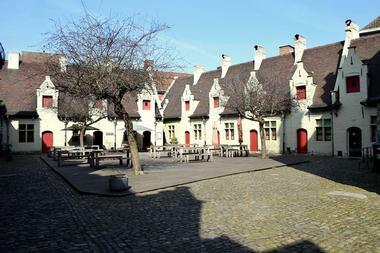 Visitors will learn of the area’s rich history and the story of Ghent’s burgeoning economy during the Middle Ages through the port’s ancient buildings. These include the Guildhall of the Free Boatmen, the house of the Grain Weighers, and Spikjer, among many others. 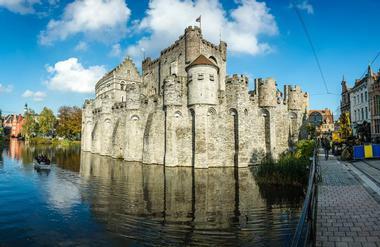 Gravensteen, the Castle of the Counts, is Ghent’s premier tourist attraction. This medieval fortress has a long and storied past dating back to the 10th century. It was home to Counts, then the Council of Flanders (the county’s high court), and a semi-subterranean prison and torture chamber during the 14th to 18th centuries. In the 18th century, it became an industrial complex, and by the 19th century was set for demolition. Today, it hosts visitors, cultural activities, and the occasional wedding. Visitors can expect to see instruments of torture and executioner’s tools in the museum of torture. There is also a museum of medieval weapons. The History of Sciences Museum displays an evolving and extensive collection of historical scientific instruments that the University of Ghent has used in research and education over the last 200 years since the school’s beginning in 1817. 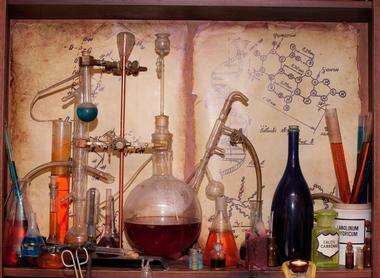 Featured collections represent the science disciplines, including biology, chemistry, physics, botany, and mathematics. The collections tell the story of scientific research and modernization in Ghent and showcase the work of great scientific minds like Joseph Plateau, the father of film, and August Kekulé, the founder of aromatic chemistry. Collections of microscopes and surveying instruments as well as a history of electrical machines are also on display. The House of Alijn depicts the evolution of daily life in the 20th century with examples of both ordinary objects and curiosities. The museum uses found objects, film, photos, and audio to tell the story of the century. The well-curated museum beautifully displays objects in the everyday environments in which they would be used, like a barber shop, a child’s room, or a living room. There is an interesting collection of private videos that Ghent citizens recorded to tell their stories, giving visitors a glimpse into the life and times of Ghent in the 1900s. Korenmarkt is a busy square lying between the Lys River and St. Niklaas Church. One of the city’s most popular places to people watch, the expansive terrace area is home to cafés and eateries. Early risers may want to grab a coffee from Mokabon, a wildly popular coffee shop, before exploring the historic buildings surrounding the square. There are numerous bars, restaurants, and terraces that are often filled with students and tourists, especially during summer. Although cars are not allowed in the square, travelers should expect to see plenty of bikes, buses, and trams. The Museum of Fine Arts (MSK) is an open concept museum and energetic meeting place where beauty, art, and knowledge intersect and are shared with everyone to evoke imagination, increase critical thinking, and reflect on the world. It is a place where both past and present can be considered while also shining a light on the future. MSK is home to collections of art from the Middle Ages to the present day, and leads in exhibiting modern art from the 19th and 20th centuries. While it has roughly 9,000 works, there are only about 450 pieces in their permanent collection with a focus on painting from the Southern Netherlands. 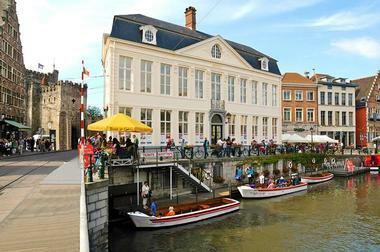 Patershol is a charmingly cozy neighborhood in Ghent lying in the shadow of the iconic Castle of the Counts. The cobblestone streets are just as they have been since medieval times, offering visitors the unique experience of walking along the pathways of the past. The prominent culture center of Caermersklooster resides within the town, showcasing spectacular permanent and traveling art exhibitions. Visitors will also find the House of Alijn, specialty shops, and various other art galleries in the area. Foodies will enjoy the several restaurants that have popped up over the years along the medieval alleyways, serving all types of food from French and Thai to traditional Flemish cooking. 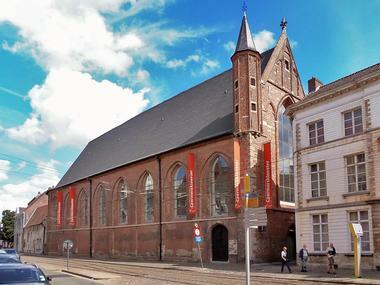 The Provinciaal Cultuurcentrum Caermersklooster is a fully restored friary of the Calced Carmelites that currently serves as an exhibition space. Each year this monumental space features various exhibitions in a setting where the highly distinctive light creates an artistic atmosphere that’s hard to beat. Among the current displays are the Ghent Altarpiece, the restoration of the Lamb of God, and ROOTED, a fresh look at one of the prominent turning points in the art history of Flanders. The past exhibitions include A Miraculous Garden – Flora on the Ghent Altarpiece, and Movie Theaters, which was a double exhibition focusing on the past century’s vibrant cinema culture. Saint Michael’s Church is a Roman Catholic Church that was built around 1440 and is dedicated to the Archangel Michael. It was originally designed to stand at a soaring height of 439 feet, but unfortunately it was only built to 78 feet with the unfinished tower receiving a closed roof in 1828. Its destiny changed due to religious conflicts, looting, and destruction between 1566 and 1579. Between 1623 and 1659, architect Lieven Cruyl rebuilt the church, creating a rich neo-Gothic interior featuring a pulpit and an altar. 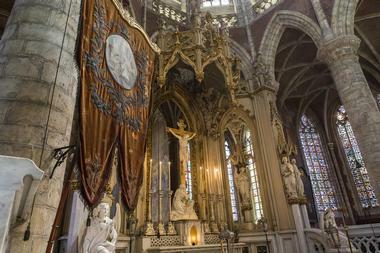 It is decorated with neoclassic and Rococo statues, and multiple baroque and 18th-century paintings, including the iconic Christ Dying on the Cross by Anthony Van Dyck. 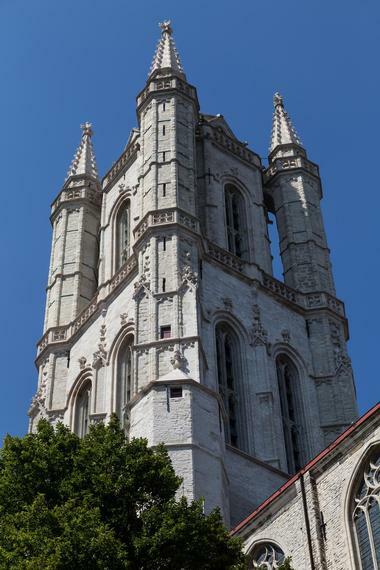 St. Bavo's Cathedral was consecrated by Transmarus, bishop of Tournai and Noyon in 942, which dates the cathedral back to the chapel of Saint John the Baptist. Its imposing structure was consistently rebuilt from the 14th to the 16th century and it still remains relatively the same. For more than a thousand years, the cathedral has served as a place of Christian worship and prayer, and still provides Holy Mass. It also welcomes visitors to explore the magnificent structure and the various pieces of art and treasures that are housed within. Among the must-see sites is the chapel that features the famous painting The Adoration of the Mystic Lamb. St. Michael’s Bridge is centrally located close to the Korenmarkt, crossing the Lys River. The neo-Gothic bridge was built in 1910 and boasts magnificent views of the three towers of Ghent, the belfry, St. Nicholas Church, and St. Bavo’s Cathedral. The guild houses on the enchanting Graslei and Korenlei, the renovated Old Fish Market, and the towers of the Castle of Counts can also be seen from the bridge. While the bridge allows visitors the chance to take some enviable pictures of the famous surroundings, its close proximity to prominent attractions such as the Brabant Gothic St. Michael’s Church and Het Pand also make it worth a visit. 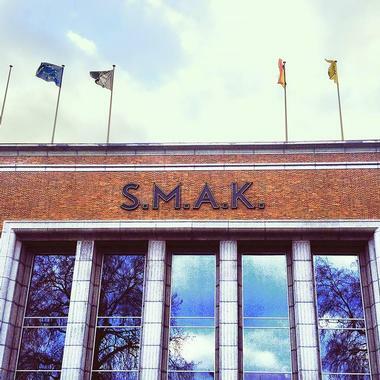 The Society for the Museum of Contemporary Art (S.M.A.K) first opened its doors in 1957. Its founder Karel Geirlandt had the ambition to provide an independent museum focusing on modern trends in the art world. The S.M.A.K. presents itself as a place of renewal and experimentation, where they may see today what will be important tomorrow. It’s an open space that yearns to make its visitors think and question in order to see what the future may bring. Today, it houses 3,000 works of contemporary art from World War II until now, including works from prominent movements such as pop art, COBRA, arte povera, and minimal art. The Universiteit Gent Botanical Garden sits on 2.75 hectares of land that are home to over 10,000 plant species reside. Adjacent to the Citadelpark, the garden features several greenhouses including the Victoria, Subtropical, Tropical, and Succulent House. The botanical garden offers 2-hour guided tours for adults as well as guided children’s tours, which include a complementary tasting of the fruits and other plant products grown here. Visitors to the garden will get the chance to learn about the various plants housed here and their relation to mankind, or they can simply enjoy a leisurely stroll through the picturesque setting. 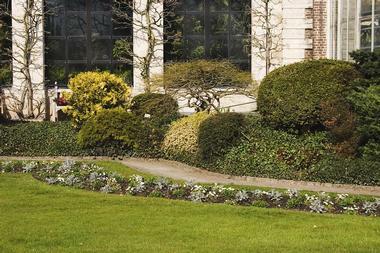 The garden also features various collections such as the herbarium and seed collection. 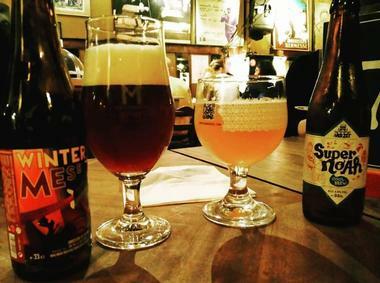 Belgium beer fans will adore Belgium Beer Days private beer tasting tours. Guide Liselot Caura takes visitors to the most interesting places to drink beer in Ghent. 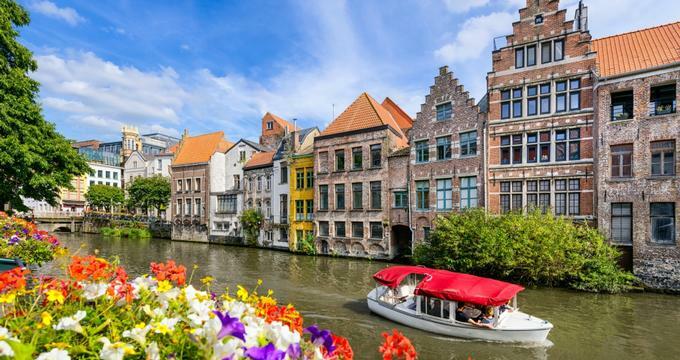 On the tour, Caura guides visitors through the charming streets of Ghent, all the while telling stories and interesting facts about world-famous Belgium beers. Visitors will learn about the history, popularity, and characteristics of Belgium Trappist, fruit, Gueuze, Old Brown, Saison, and amber blonde beers, as they have opportunities to taste each. They’ll also learn about local breweries and brewing processes. 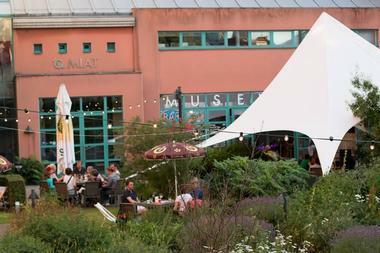 In July, Belgium Beer Days partners with Booot.be for beer boat tours during Ghent Fest. Instead of walking tours, visitors can cover more ground faster by renting bikes and taking biking tours instead. It’s easy to navigate the carless streets of the historic center, exploring the medieval architecture, monuments, and museums. 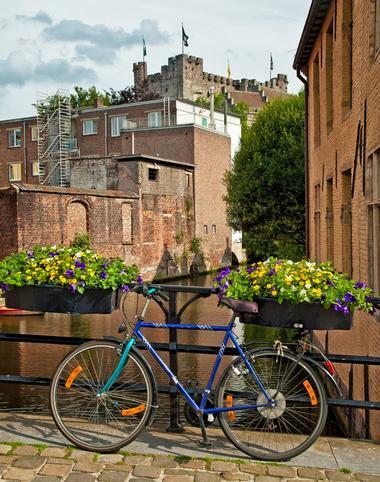 The Sorry, Not Sorry Ghent graffiti tour that spreads across the city is also easier by bike. The Chateau Route takes bikers out of the city into the lush countryside on a tour of castles and country houses, including Laarne Castle, a moated fortress from the Middle Ages. The Cycling Route follows the green belt around the outer edge of Ghent. Bike Gent offers a preferred bike rental list of vendors. Boat in Ghent provides visitors with a number of services, including city boat trips, hop-on hop-off water tramway tours, and themed boat trips. 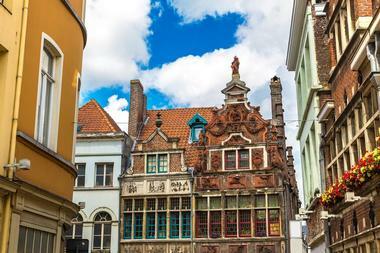 Travelers might choose a 50-minute or a 1-hour tour of Ghent’s medieval center to get an overview of the city and decide on where to focus their time, or a more thorough 90-minute or 2-hour historical explanation by an onboard guide. Serious travelers may prefer the hop-on hop-off water tramway tours. They combine the historical guided tours with six stops, where visitors hop off and follow six fascinating walking routes, hopping back on and learning more from the boat guides between stops. City Running Tours takes visitors Ghent on a “Stop & Go” running tour of between 6.5K and 10.5K, depending on what the group wants. Their mission is to show off the beautiful city of Ghent, but to do it in a fun way, so they explain the history, economics, and social life of the city on short frequent stops. Small groups are up to five runners, and runs are organized every day that there is demand. City Running Tours also offers expat and international student runs to help newcomers quickly become familiar with the city. Discreet VIP tours are available for recognizable people wanting to maintain privacy on runs. All but the VIP runs meet at the Backstay Hostel Ghent. Ghent History Tour is a walking tour of the city’s historical center between the Lys and Scheldt rivers, led by Ghent Guides. The 2-hour tour meets at the tourist office and travels a distance of 2.5km. Guides will explain the history of Ghent along the way, answering curiosities like why the castle of the Count of Flanders wasn’t built inside the city’s historical center. The walk includes such Ghent highlights as the city hall and town hall, Castle of the Counts, Groentenmarkt and Vrijdagsmarkt, Patershol, and the Old Port. Tours are run daily during the summer months and weekends only the rest of the year.